Trust Heavy Haulers For Your Machinery Shipping Needs – Anywhere in The Country! Heavy Haulers is a comprehensive shipping service for large machinery, construction equipment, and agricultural equipment. We've made specialty transportation our area of expertise, from moving cranes and other excavation machinery to rural areas to shipping booms, scissor lifts, and cranes through congested urban areas. With plenty of options for shipment, trust Heavy Haulers to transport your machinery from one job site to the next. Give us a call at (800) 908-6206 to get started! Your Heavy Haulers experience isn't limited to the continental U.S. We ship door-to-door anywhere in North America and beyond. Our drivers are certified and bonded, trained to negotiate rough roads and city traffic. Using only the correctly rates trailers and transport equipment, we ensure that your machinery arrives at its destination on time and undamaged. The logistics specialists plan out the best route for your shipment, taking into account the weight and size. We understand that different states and roadways have different regulations for transport, so we always make sure that we're in compliance with state and local laws. We even handle paperwork, from weigh station documentation to customs forms. Heavy Haulers enjoys a challenge. That's why we are the first – and often only – shipping service that construction company owners, government contractors, and oil rig specialists call to move their equipment from one job site to the next. Warehouse operations trust Heavy Haulers to move delicate specialty machinery without damaging expensive computer grids or gears. Even agricultural companies ask us to help move small planes, helicopters, and food processing machinery. Discover what Heavy Haulers can do to improve your next project. One phone call to (800) 908-6206 and you'll receive a FREE, no obligation quote for your machinery shipment. Heavy Haulers Will Ship Your Machinery Carefully and On-time! Once you decide on the right shipping service to suit your needs, we will then work closely alongside you to work out the right price, so that you will always be able to enjoy our service without paying an arm and a leg. 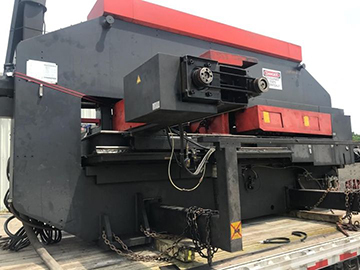 Moreover, we want to be sure that you are receiving a tremendous price on your machinery shipping, and we always provide fabulous deals on all our machinery shipping services. We have also hired some of the most qualified professionals in the transport industry, and we are consequently in a position to provide you with fantastic service. Keep in mind that Heavy Haulers has experience transporting plasma machines, engraving machines, laser machines, and milling machines. You ought to consider the fact that we are a high-quality provider of all sorts of industrial machinery shipping services. Therefore, whether you need help with moving, shipping, hauling, towing, or transporting your machinery, we will be able to help. Heavy Haulers Ships Other Types of Equipment Such As.. The professionalism of our team helps us to ensure that all our customers get a top of the line service. Given the wide variety of machinery that we ship, we will be able to find the right shipping service to suit your needs. Our professional shipping experts are also at your disposal to make sure that you always receive the assistance you need. No need to get in touch with a ton of different shipping companies, and to try to negotiate reasonable prices. Our top of the line service will, consequently, save you time and energy. Additionally, with Heavy Haulers, you will also be able to enjoy a fantastic and impressive shipping provider. The information provided by our employees allows a shipper to have the support they require to choose their next machinery shipper with peace of mind, with confidence, and without the difficulty of trying to find a qualified machinery shipping company. You merely have to consult with our specialists to determine the accurate price. Also, by hiring Heavy Haulers, you will be able to relax with the satisfaction of knowing that you are receiving a top of the line machinery shipping service at a fantastic price. Consequently, this fact signifies that you will be able to visit our business and we will then help you determine the right shipping service for your needs. Forget about the hassle of visiting different providers with the aim of discovering a competent machinery shipping service provider. Therefore, you ought to be cognizant that all you have to do is contact us and we will take care of the rest. Give us a call toll-free at (800) 908-6206 or click the button below to fill out a form to request a shipping quote. We look forward to serving you!